History of Earth’s atmosphere is revealed by the longest ice-core record of climate history ever obtained. Levels of greenhouse gases are once again proved to be proportional to changes in temperature. 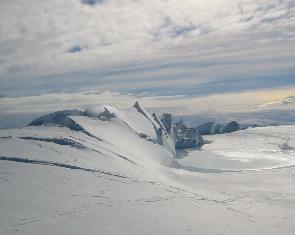 Record of Earth’s early atmosphere was obtained from the tiny air bubbles trapped in a deep ice core from Antarctica. The frozen record is 3270 meters long and covers the last 650,000 years – 50% longer than before. The predictions from climate models used to forecast future global warming are proved correct by the coupling between temperatures and the greenhouse gas levels revealed by the core matches. The finding also reveals a piece of good news. Contrary to the view that we may already be due for the onset of the next ice age, the finding reveals that the warm interglacial periods between ice ages can last a long time! Spending years drilling the ice core in Antarctica’s Ice Dome Concordia, the European Project for Ice Coring in Antarctica (EPICA) team had previously analyzed its record of global temperatures. But, they have now completed the detailed analysis of the trapped air. The bubbles record how the planet’s atmosphere changed over six ice ages and the warmer periods in between. But during all that time, the atmosphere has never had anywhere near the levels of greenhouse gases seen today.